If you enjoy welcoming guests to your home, an outdoor entertainment area can be a worthwhile investment. We can help you create an inviting and practical extension of your living space. 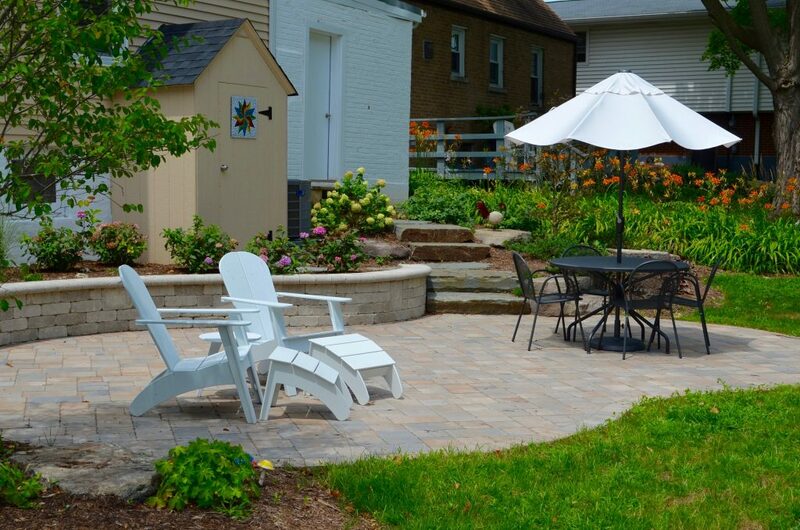 For this Lombard-area homeowner, the goal was to design and install an outdoor entertainment area that would provide privacy, functionality, and aesthetic appeal. We were faced with three primary challenges during the landscape design and installation phases of this Lombard, IL project. Working with a sloped backyard. Finding a remedy for poorly graded lawn with a fair amount of brick and stone debris remaining in the yard from previous homeowners. Connecting a wooden porch with steps, basement stairwell, and back garage entrance with the new outdoor entertainment area. We designed a free formed, organically shaped patio using Unilock Brussels Premier pavers, including a Brussels Dimensional Stone planter wall which doubles as a seat wall. Benches and seat walls provide multiple seating options for guests. Bluestone steps and pathways were incorporated for a mix of materials as well as to establish traffic patterns. Decorative stone outcroppings terrace the sloped grades to provide added visual interest. Plantings provide privacy screening, splashes of color, seasonal bloom sequence, and texture. Shrubs were used in this project as a way of making selected areas private, but you can also intermix grasses and foliage-focused plants for variety in shades and style. The lawn area was re-graded and seeded to make it level and full. Unilock Brussels Premier Pavers were used for the patio. Brussels Dimensional Stone for the planter and seat wall. Natural stone, such as Bluestone, was used for the steps, pathways, and outcroppings. Shrubs, ornamental grasses, and perennials. To see more examples of our work, take a look at our online landscape design portfolio or contact us at (630) 932-8966 for a no-obligation consultation.